My son, do not forget my teaching, but keep my commands in your heart, for they will prolong your life many years and bring you prosperity. Those who are older are not as respected in Western cultures today as they once were and as "the elders" are respected in other cultures. The Bible repeatedly reminds us of our NEED to honor those who are godly and who have gone before us. 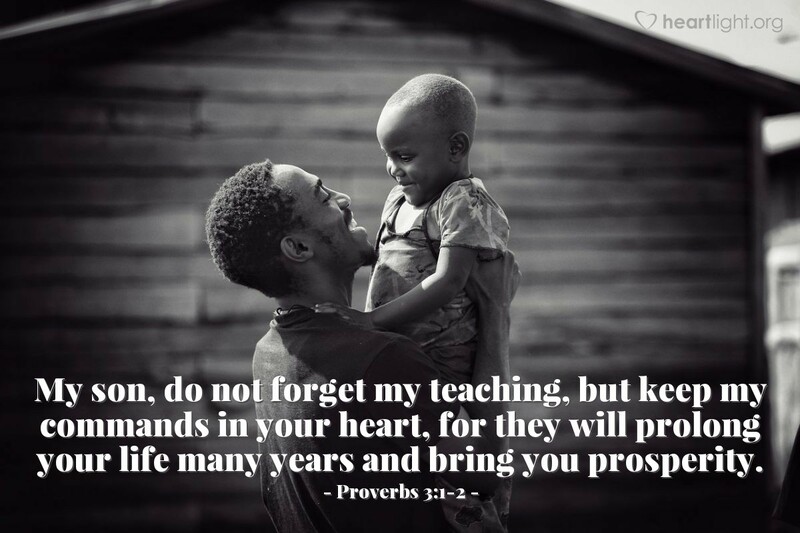 Whether the father behind this passage is the physical father of the person receiving instruction or he was the teacher of this student seeking wisdom, either way the principle is the same. We have much to learn and much to gain from heeding the voice of those who have served God for many years and have proved themselves wise and faithful. Loving God and Almighty Father, thank you for those wise people in my life that have shared your wisdom and their experience with me. Please help them know how much I appreciate their investment of love and guidance in me and please use me to do the same for those who come after me. In Jesus' name I pray. Amen.